This dish, resplendent with the red, white and green colors of the Mexican flag, was created by the imaginative Augustine nuns of Puebla for a visit by Mexico´s very own emperor, Don Augustín de Iturbide, who, after the War of Independence, lasted a mere eleven months in office. It is featured as a main. Dish during August and September, when the new crop of walnuts is available. 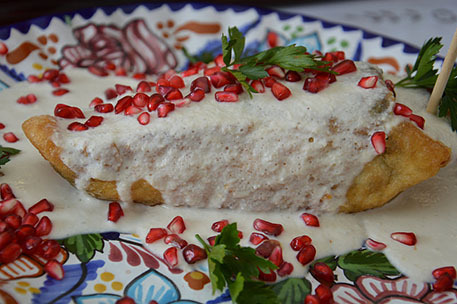 Although this dish appears complicated, the sauce and filling are best prepared the day before, and the chiles can be stuffed several hours in advance. - To prepare the nut sauce, shell the walnuts, place in a heatproof bowl, cover with boiling water and let soak for 5 minutes. Drain, then peel the thin tan skin from the nuts. Place the walnuts in a small bowl, cover with 1 cup (8 fl oz/250 ml) of the milk and let soak for 12 hours. - Drain the walnuts, discarding the milk (if packaged nuts are used, reserve ½ cup/4 fl oz/125 ml of the soaking milk for use in puréeing the nuts.) Transfer the walnuts to a blender and purée with the cream, the remaining ½ cup (4 fl oz/125 ml) milk and the queso freco, sugar and salt. Refrigerate. - To prepare the filling, place the pork, water, onion quarter, 3 garlic cloves, parsley and half of the salt in a large saucepan. As soon as the water comes to a boil, cover and cook over medium heat for 40-60 minutes or until the pork is tender. Drain, reserving ½ cup (4 fl oz/125 ml) of the cooking stock. Let the pork cool briefly then chop finely and set aside. - Heat the oil in a large skillet or saucepan. Add the chopped onion and garlic and sauté for 4 minutes or until transparent. Add the tomatoes and minced parsley and cook for 5 minutes, stirring constantly. Mix in the remaining salt and the apple, pear, peach, plantain, raisins and almonds and cook over medium heat for 4 minutes. Add the pork and the reserved stock. Correct the seasonings and cook, uncovered, over low heat for 7–10 minutes or until the fruit is cooked and the mixture has thickened. Set aside. - Roast and peel the chile (see glossary). Make a lengthwise slit in each one, being careful not to break it, and remove the seeds and membranes. Soak the chiles in water to cover with the salt and vinegar for 20 – 60 minutes, depending on how “hot” they are. - Rinse the chiles, drain well and pat dry with paper towels. Use a spoon to place some of the meat mixture inside each chile, being careful not to overstuff or the filling will spill out when the chile is cooked. Set aside. - Beat the egg white until they form stiff peaks, then stir in the yolks one at a time. Spread the flour on a plate, turn each chile in it to coat lightly, then dip into the beaten eggs, so that the chile is completely coated. - Heat ½ in (1 cm) oil in a skillet. When hot, add the chiles one or two at a time and fry on each side until lightly browned. Drain on absorbent paper. The chiles can be served cold or at room temperature. Arrange them on a platter, cover with the nut sauce and sprinkle with the pomegranate seeds. Garnish with springs of parsley. - Variations: There are as many minor variations of this recipe as there are people who prepare it. Some cooks add chopped citron, cinnamon and black pepper to the chopped meat mixture and a little sweet sherry or white wine to the nut sauce. Some use coarsely ground pork instead of cooked and chopped pork loin. The major difference is whether the chile are covered with batter or not. Traditional recipes call for coating the chiles, but you may leave them uncoated, according to your taste and the amount of time you have to prepare them.